Don’t be turned off by poorly built ponds and waterfalls with pond liner showing, rigid basins sticking out, and limited sizing and spacing. 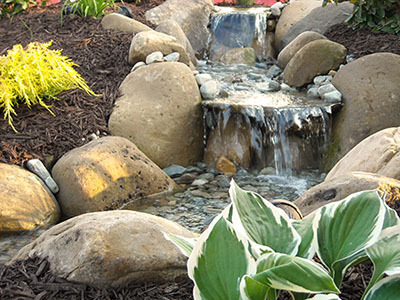 Blooming Valley Landscape & Supply has been trained and is the area’s only experienced installer of high quality gorgeous Paradise Ponds and Waterfalls. Exquisite water features can add dimension, soothing sound, and a therapeutic sense of calm natural beauty to your landscaping. We use only custom non-rigid pond liners to line your custom dug pond and falls. Your pond can be split leveled, have bio falls, pondless, more than one pool, bridges, small or giant, plants, fish, lighting and decoys. 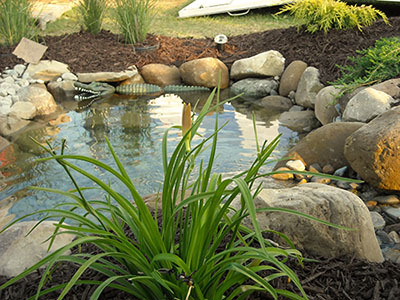 Your pond can be of use for people, fish, birds, pets, or just a work of art to admire. Waterfalls can be installed almost anywhere and completely transform a boring lawn into a customized water-garden paradise. Ask Blooming Valley Landscape & Supply about pondless waterfalls for little to no maintenance and a safer option for homes with small children. Surround your feature with landscaping, lights, and even a paver patio to accentuate its natural beauty. We use dependable, quality products from industry leader, Aquascape Designs in all of our water features, and provide consultation, design, installation, and maintenance.